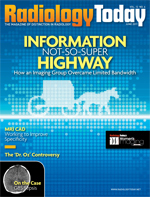 Clearly, Imaging Associates needed a way to optimize its wide area network (WAN) connectivity. While considering options offered by dominant player Cisco as well as “a couple smaller companies,” Otis met the local sales representative for Boulder, Colo.’s Circadence Corporation, a company specializing in IT system performance improvement. The current method for transmitting data, transmission control protocol (TCP), has been around for a long time—from the days when data files tended to be small and “flat,” explains Circadence Chief Technology Officer Robert J. Shaughnessy. Since then, data files—especially graphic image files—have grown to previously unimagined size. While the IT industry has pushed hardware and cabling speeds to achieve greater bandwidth, available service varies considerably across the United States. In rural Mississippi, some areas have only recently acquired cable and asynchronous DSL data services. The cable company can provide multiple T-1 lines but at a high cost to the subscriber. Technologies like optical carrier, capable of delivering hundreds of megabits per second, are a ways off. Many typical approaches to WAN optimization are not only complicated for the end user but also expensive to deploy. Equally important, standard data compression for images tends to degrade quality. Compression’s data loss and corruption leave images unreliable for medical purposes so WAN optimization that relies on file compression must use a “lossless” protocol. In bringing its WAN optimization products to the medical market, Circadence capitalized on its extensive experience in providing optimization to the U.S. Department of Defense in situations requiring data accuracy and critical security across a spectrum of connection types and platforms. Compare the process with a railroad: Two trains travel the same distance at the same speed carrying exactly the same freight. One train pulls 100 boxcars with contents varying from 5% to 60% of capacity, including several empty cars. Let’s say the train overall is loaded to only 25% of its true capacity. The second train, pulling cars packed to 100% capacity, will obviously need only 25 boxcars. Its entire load will arrive sooner and will require far less track space. That means more room on the track for better-packed trains. Otis says the costs associated with the installation hardly compared with the T-1 solution. The purchase price for the Circadence host unit in Tupelo was less than one month’s subscription for T-1 at both ends. The remote unit at Ripley cost little more than one half of that. In other words, a one-time investment totaling less than two months of T-1 service yielded far more dramatic transmission time reductions. “Circadence’s cost-to-performance ratio is really very good,” Currie says. “It’s really inexpensive, especially when you consider the transmission time improvement and its ease of use for the physicians.” It has made a difference in the doctors’ productivity because they spend much less time waiting for an exam to download to a workstation. Physicians’ efficiency improves not only because they can spend more time reading and less time downloading but also because they can distribute work more easily. If one location finds itself deluged with a high volume one day, it can enlist the help of doctors working at a less busy facility by quickly transmitting some images off site for reading and interpretation. The Circadence MVO system’s flexibility allowed Imaging Associates to add another dimension to its physician efficiency. It installed the MVO system on Web servers at both its main Tupelo office and at the 164-bed Magnolia Regional Health Center approximately 60 miles away in Corinth, Miss. That gave physicians secure, high-speed access to image files on either server at any time using their MVO-equipped laptops and home computers with Web access. Otis said the Circadence appliances are completely transparent to other users but provide performance jumps for Imaging Associates’ providers. The technology works well for Imaging Associates. With a reasonably low-cost investment, the practice has realized performance gains in all its installations across a variety of platforms. The Circadence solution has provided dramatic improvements on everything from T-1 lines and Web servers to asynchronous DSL and cable modems as well as remote PCs and laptops. • Protocol optimization: Optimizing programs modify TCP behavior and “pack the data pipe” with information. Networks with large bandwidth-delay product (large fat networks) often benefit the most from this approach. WAN optimization takes many forms, but all approaches seek to move more information over the network in less time. Until we have a new file transfer protocol, TCP will continue to challenge IT specialists to invent new and better ways to improve efficiency.